Meet the couple who have converted a nuclear missile site into a family home. The Freaky gets an exclusive tour. 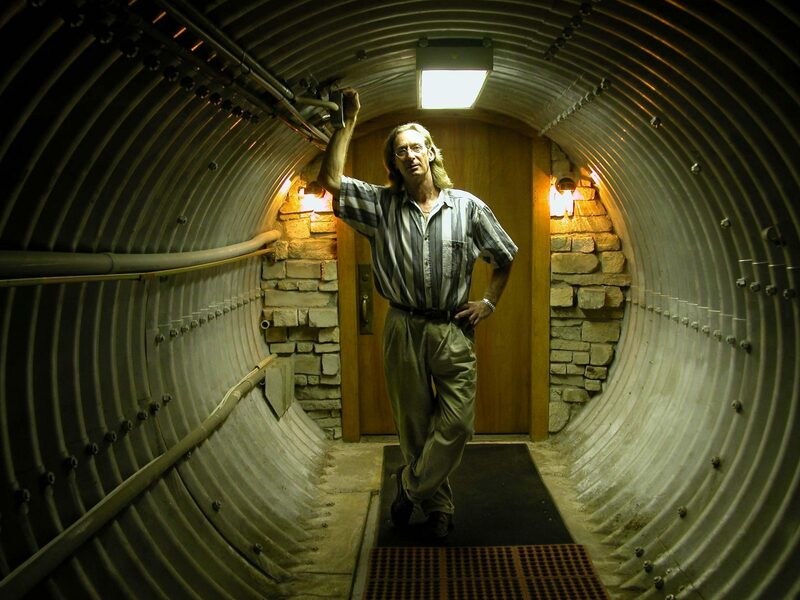 Ed Peden at the entrance to his underground nuclear missile bunker home. The Midwest of the United States is infamous for its tornados and thunderstorms. So people’s homes here have to be built tough to ensure a good night’s sleep but Ed and Diana Peden are a couple who’ve taken that to the extreme, with a home 20 foot under ground. Ed and Diana were also worried about much darker forces than tornadoes. I first came across this property in 1982. President Reagan was at the helm and he was talking about the evil empire and there was a threat of nuclear war and I had young daughters and I was worried so I came upon this place and it was flooded and in ruin and yet I just couldn’t forget about it. The Kansas nuclear missile bases during the Cold War. Ed and Diane Peden’s living room, formerly a nuclear missile bunker. For $40,000 Ed bought 33 acres of land, plus 15,000 square feet of underground property. Sounds like a bargain? Ed thought so, but it turned out to be an epic renovation project. Ed: “It had been flooded for probably 12 years or so and it was a mess and most of the sheet rock was sludge on the floor, black smelly stuff. It all had to be disassembled and carried out”. Although built to withstand a nuclear attack, this is not a nuclear shelter – it’s a nuclear missile launch site – Atlas E Missile Base Number 6. In the mid-1950s, the nuclear arms race between the Soviet Union and the US, intensified – with the US secretary of state announcing a policy of ‘massive retaliation’. Both superpowers battled to build ever-more devastating weapons. The US focused on powerful nuclear missiles, with incredibly accurate guidance systems. By the early 1960s, Kansas had become the location for many of America’s missile bases, with over 20 installed across the state – Ed and Diana’s home is one of them. Their two storey living area with 15 foot ceilings is connected to a launch control bunker, all reinforced with super-strength 18 inch thick walls. The missile itself was removed long ago by the Government, but the house still retains many original features. There’s also a 120 foot tunnel, which takes you to the launch control area. Ed: “This was called the launch service room and in the missile days, and no-one could launch this missile, you couldn’t fuel it without certain codes that were changed daily that came in from Washington DC being placed into this system”. “There were always three men in this room and they could press certain buttons on the launch control panel and send this missile off and kill 50 million people halfway across the planet”. The room where Ed now stores his junk, once contained a 4 megaton thermonuclear warhead, capable of destroying a city the size of London, in a flash. An Atlas Nuclear Missile like the one that used to be stored in Ed Peden’s home. Incredibly, despite millions of dollars and hours spent on its construction, the Atlas missile turned out to be a white elephant. Designed to launch in less than half an hour, it actually took so long to get upright and ready for action, that enemy missiles would have struck long before it even left the ground. It seems hard to believe, but no matter what they tried, the crews couldn’t prep the missile any quicker. So in 1965, only four years after construction, the site was actually decommissioned – without a missile ever being launched. Ed: “I absolutely would not want to live anywhere else and we could swap, we could sell very nicely and live most anywhere we wanted, we like it here. This is home and we’ve put so much of ourselves here, it would be giving up a part of ourselves. This has been a life-defining project. I can’t imagine living anywhere else”.